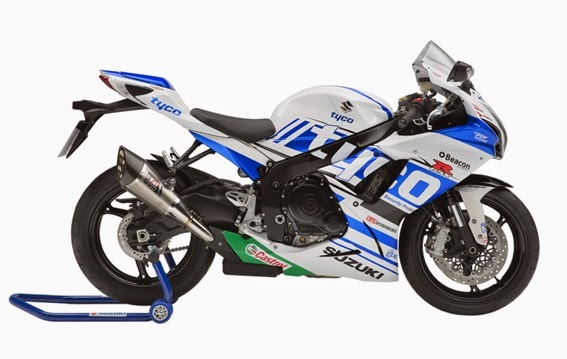 Suzuki GSX-R600 Tyco Ras Replica Specs and Price - Suzuki GSX-R600 Tyco Ras Replica comes with several special features that provide aggressive and sporty character of the Suzuki GSX-R600. Some of the features offered are Official Tyco team livery, Yoshimura R11 silencer with titanium body and carbon end cap, Suzuki genuine double bubble screen, Suzuki genuine solo seat cowl, and Suzuki genuine paddock stand and bobbins. Suzuki GSX-R600 Tyco Ras Replica equipped with engines 599 cc, 4-stroke, 4-cylinder, liquid-cooled, DOHC engine which is mated on a six speed constant mesh transmission. The unit generates a maximum output of 92.50 kW (124.00 hp) at 13500 rpm and 69.60N.M (51.00lb.Ft) at 11500 rpm.